Nutrisystem meal delivery service provides a variety of easy and healthy weight loss solutions. It offers meal plans for men and women, omnivores and vegetarians, and people who suffer from diabetes. Its approach to weight loss centers on balanced nutrition, portion control, and frequent meals and the service provides everything you need to satisfy your cravings throughout the day, including breakfasts, lunches, dinners, and snacks. In addition to its impressive assortment of meals and snacks, Nutrisystem offers bars, shakes, and boosters that are designed to help maximize weight loss results and add extra vitamins, minerals, and nutrients to your diet. In this article, we focus on the unique and often unjustly neglected Nutrisystem shakes. 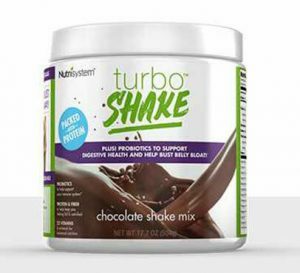 Nutrisystem shakes are divided into two major types – TurboShakes and Nutri-Pro Shakes. Both TurboShakes and Nutri-Pro Shakes come in two classic flavors – chocolate and vanilla. TurboShakes are primarily designed for women and contain plenty of proteins, fiber, and probiotics, including Nutrisystem’s proprietary probiotic blend. They promote weight loss, naturally improve digestion, and help you burn belly fat more easily. They include more than 22 essential minerals and vitamins. A single serving of Nutrisystem TurboShakes contains 150 or fewer calories. High fiber content (20% of total calories) does not only improve metabolic function but also eliminates cravings. You can use TurboShakes as “powerfuels” – protein-packed snacks that keep you feeling full for longer. 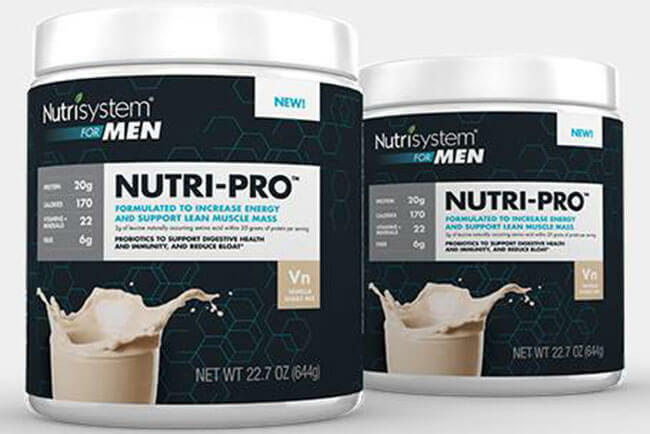 The Nutrisystem program requires you to consume 3 powerfuels per day and these shakes make for a perfectly convenient and quick turbofuel solution. Nutri-Pro Shakes are primarily designed for men. These are protein-rich, low-glycemic shakes created to sustain energy and promote the development of lean muscle mass. Just like TurboShakes, they contain probiotics for better digestion and faster elimination of belly fat. They are rich in both vitamins and minerals. A single serving of Nutrisystem Nutri-Pro Shakes contains around 170 calories. Nutri-Pro shakes have a higher calorie content than TurboShakes since they are designed for men, who have higher metabolic needs than women. Furthermore, Nutri-Pro shakes are fiber-rich, with 24% of total calories coming from fiber. Like TurboShakes, Nutri-Pro shakes can be used as turbofuels while on the program. Nutrisystem shakes contain around 50 different ingredients. In this ingredient overview, we will focus on the most important substances present in TurboShakes and Nutri-Pro shakes that play crucial roles in supporting weight loss, the development of lean muscle mass, and digestion and metabolic function improvement. Calcium caseinate – It is a milk-derived protein that prevents cravings, keeps you full, and helps build lean muscle mass. Nutrisystem shakes also contain magnesium carbonate, vitamin A palmitate, vitamin D3, potassium iodide, folic acid, thiamin mononitrate, riboflavin, manganese sulfate, stevia leaf extract, milk, soy, and a dozen of other ingredients, including sweeteners, colors, and minerals. Nutrisystem shakes are designed to keep you full, improve your metabolism and digestion, give you energy, and boost your overall health. They take longer to digest, but they are not hard to digest. They are rich in probiotics, so they prevent bloating and keep you feeling light and satiated. Thus, Nutrisystem Shakes do work in a sense that they provide the liquid calories your body needs, reduce and prevent cravings, and support bodily functions that contribute to weight loss. It is important to note that both TurboShakes and Nutri-Pro shakes are tasty and quick to prepare, so they make a good choice for busy individuals who do not have the time to prepare low-calorie, nutrient-rich snacks several times a day. As a Nutrisystem customer, you get your shakes in the first shipment within all Nutrisystem plans and in every shipment with the Uniquely Yours Plus plan, but you can also order as many of them as you wish from the A La Carte menu. The shakes come in packs of 7, 14, and 28 servings. No matter which type and flavor you opt for, you pay $25 for 7 servings, $39.99 for 14 servings, and $79.98 for 28 servings. If you want more vitamins, minerals, and nutrients in your shakes, you can enrich them with the addition of TurboBoosters. A 7-pack of TurboBoosters costs $19.99 while a 14-pack costs $39.99. Nutrisystem shakes are low-calorie, protein-packed, fiber-rich, micronutrient-rich shakes that can help you maximize your weight loss results. They contain more than 20 vitamins and minerals that aid weight loss and the development of lean muscle mass and have multiple health benefits. They boost immunity, metabolism, and digestion, allowing you to lose weight healthily and eliminate potential problems that may be preventing you from reaching your weight goals. On top of that, they are tasty, quick to make, and rather affordable, so they can help you save both time and money and allow you to focus less on dieting and more on your daily tasks.